Great on-the-go package lets kids and families take this item in the car, on a plane, into a restaurant, or anywhere you might want an engaging activity that's easy to start and easy to clean up. Just toss everything back into the handy carry-along tote! Play for a few minutes or a few hours. Reusable cling stickers make this an activity kids will go back to again and again. 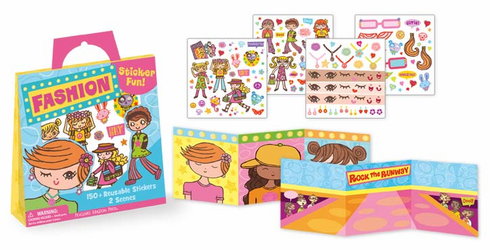 Includes two 6.25" x 18.75" scenes, 150+ reusable vinyl cling stickers, and Tote measures 6.75" x 6.75" x 1.25"